64/65 Kim Hollis Just laughable. Thankfully, I fell asleep before the end. 159/159 David Mumpower I am astonished by the fact that the director who created the wonderful Equilibrium could fail so completely in his sophomore outing. Stands the test of time as Worst Movie of the Year. 198/200 Max Braden Like a bad video game. A disappointment compared to the very good Equilibrium. If while watching trailers and commercials for Ultraviolet you think, "I feel like I've seen this before," it's because you have. Several times and in a variety of iterations - most recently in the form of Underworld 2. Ultraviolet takes place in the late 21st century, where a segment of the human population has been genetically modified by a vampire-like disease known as Hemophagia. These individuals are distinctly different as they have enhanced speed, stamina and intelligence. Since the differences between human and "hemophage" are becoming more and more apparent, soon the two factions are pushed to war, with the humans intending to completely destroy the "diseased" population. 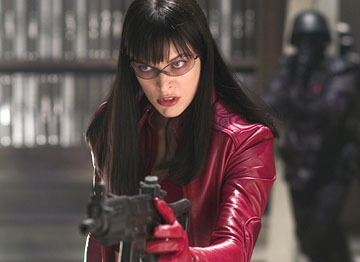 An infected woman named Ultraviolet (Milla Jovovich) finds herself in the middle of this battle. She's charged with protecting a nine-year-old boy who has been marked for death by the human government as they believe he is an extreme threat. While Ultraviolet appears to bear stylistic similarities to the aforementioned Underworld series and The Matrix, in story it actually follows a couple of other films. Naturally, given the notion that the "vampire" characters have super strength and are in conflict with humans, the Blade franchise comes to mind. But perhaps even more significant is the parallel to Jovovich's previous work in the Resident Evil films, where she is fighting a disease that causes humans to become zombies - but in some cases, they become much more than that.